Summit County leaders want to partner with local marijuana dispensaries to add a symbol on the packaging of edible marijuana products that seems likely to deter children, perhaps similar to Mr. Yuk poison labels employed in some parts of the United States, particularly in the 1970s and ’80s. Laurie Blackwell said the thought of a child finding an adult’s THC treats and eating more than is recommended for several adults keeps her up at night. “I am terrified,” said Blackwell, who runs the county’s Healthy Futures Initiative. Part of the county’s Health and Human Services Department, the initiative is a five-year program paid for by a grant from the Substance Abuse and Mental Health Services Administration. Blackwell said the initiative’s goal is to educate and encourage youth and the community as a whole to make positive choices that lead to healthy substance-free lifestyles. A few months ago, Blackwell and a couple of her coworkers sat down with Breckenridge Police Chief Shannon Haynes and talked about how they didn’t think the state’s “don’t be a lab rat” campaign, created in response to the legalization of recreational marijuana, resonated with Summit County kids, teens and young adults. Since September, she and Haynes have been working on a five-year countywide multimedia campaign, seeking money and support from local government officials, law enforcement agencies, the school district and other community organizations. Before Halloween, the Breckenridge Police Department circulated a flier asking parents to check their children’s candy for marijuana products made to look almost identical to popular chocolate bars and treats sold by candy giants like Hershey’s. Though manufacturers have been sued and forced to stop or drastically change their packaging, Blackwell said those products may still be available. Plus, she said, edible forms of marijuana, like cookies, lollipops and sodas, often look enticing to young children who may not know better. Some studies have highlighted risks of adolescents consuming marijuana, which one Summit County mom recently pointed out is stronger than it was a generation ago. “For legal users that may be great news, and for some medical users it could be a godsend. For parents concerned about brain development, the implications are more disquieting,” Cindy Bargell wrote in a Nov. 18 letter to the editor. Blackwell said the marijuana campaign would have a couple parts. The first part of the campaign would be encouraging locals and visitors of all ages to think of Summit County first and marijuana second. “It’s getting a little annoying for a lot of people to get off a plane and get the same reaction every single time they go out of state,” Blackwell said. The campaign’s messages will be directed toward young children, adolescents, teens, young adults and parents, and shaped for the target audience. For example, she said, second- and fourth-graders could hear messages of empowerment while high schoolers might be asked what makes them unique and great. Healthy Future Initiative already does community-wide substance abuse trainings and in-school presentations, but Haynes said those efforts aren’t enough. The campaign will push its messages through radio, TV and newspaper ads as well as on Summit Stage buses and in the Dillon movie theater. This spring, Blackwell plans to collect community survey results on marijuana use and perceptions as a baseline. In the campaign’s third year, she will collect more surveys to see if anything should be adjusted, and a final survey in the fifth year will measure the campaign’s effectiveness. The second focus of the campaign is on the edibles sticker, which will be smaller than a quarter with a symbol on it that doesn’t frighten or attract children but makes them not want to touch, eat or play with the product. “My hope, my sincere hope, is that adults buy these and they have the portion they’re supposed to and they lock them up, but we can’t guarantee that,” Blackwell said. The sticker would also remind adults to put away their marijuana treats, she added. She has tested some designs, including a dragon and some alien figures, and plans to finalize the symbol in January after more testing in local preschools and elementary schools. A Breckenridge officer is already educating housekeeping staff to look for marijuana symbols like pot leaves and the letters THC, but Haynes said she was concerned after a handful of adults were seen by medical professionals after ingesting something they found left by vacationers. Over the summer, a child in Basalt became ill after eating marijuana-infused candy her mother brought home from her job as a housekeeper at an Aspen hotel. The sticker would not be mandatory and would need communitywide investment to be successful as well as support from local dispensaries. “We’re not trying to in any way put a stigma on the product,” Blackwell said. Two Summit County dispensaries said they supported the sticker idea. At Breckenridge Cannabis Club, compliance manager Richela Neet said her store would be happy to put on a sticker as long as it doesn’t cover up the language required by the state. Stores selling medical and recreational marijuana must follow laws that require products have the Colorado Division of Marijuana Enforcement seal, nutrition information and labels that warn of potential health risks and encourage consumers to keep the products away from minors. The products also must leave the shops in opaque, certified child-resistant packaging, which Neet said is designed to take a child younger than 5 at least five minutes to open. 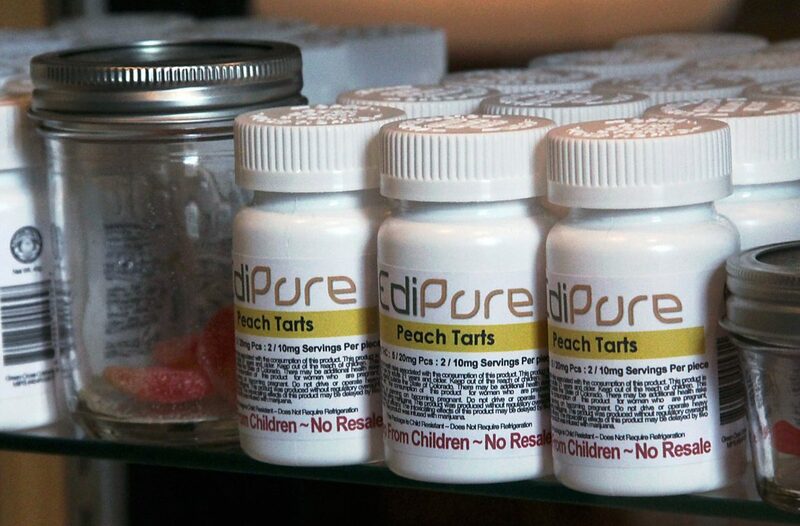 In February, new laws will shift packaging compliance to the wholesale edibles producer, and edibles will be required to be divided into serving-size portions and individually wrapped. “You won’t get a 100-milligram bar ever again,” Neet said. A sign near the exit at Breckenridge Cannabis Club warns customers that they could get in trouble for walking outside with unpackaged products, she said. High Country Healing also includes a card with written instructions like “be patient and have non-medicated snacks handy.” It tells consumers to breathe deeply and try lying down in a dark, quiet room with a glass of water if they’ve eaten too much. No one has ever overdosed on cannabis, he said, and those who seek medical attention will simply be monitored and given fluids. His staff also tells customers to keep their products in the packaging at home, even to people who shrug off the suggestion because they don’t have children or pets. If young children can’t see the treats, he said, they shouldn’t be a problem.